The Social Network, the David Fincher-directed tale of the founding of Facebook by Mark Zuckerberg, has already run afoul of Facebook’s founder. Zuckerberg insists he won’t be seeing the movie, dismissing it as fiction. However, he’s got a connection to the film (other than the fact it’s based on his life, that is). 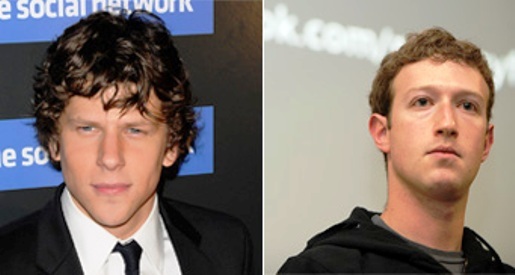 Jesse Eisenberg, who plays Mark Zuckerberg in the Facebook movie, has a cousin who works for the actual Facebook. Confused yet? “Mark came up to him at a party during his first week on the job and said: ‘I think your cousin is playing me in a movie; that’s really cool,’ relays Eisenberg. “I couldn’t have heard better things from my cousin both personally and professionally about Mark. It coincides with how I feel having played him as well.” Eisenberg has gone on the record saying he’d like to meet the man he spent 6 days a week, 14 hours a day playing for the movie; the feeling is apparently not mutual. Meanwhile, that Lifetime Original movie about the founding of the now-irrelevant MySpace continues to gather dust at your local dumpster.